Here are more second thoughts regarding previous posts. The updates are based on additional experience, news, modifications, and ideas relating to these tools. The Domino Effect, June 12, 2009. It takes time for woodworkers to develop faith in new forms of joinery, as in new glues and finishes. We would like to have a crystal ball to see how they perform a few generations into the life of a piece. To ease my lingering doubts, I assembled a few test joints with the Domino and annihilated them with a 3-pound drill hammer. The wood failed before the joints. A very light sanding of the surface of the domino tenons to improve wetting seems like good insurance. I’ve used Domino joints in high-end pieces but still don’t think they will ever replace traditional mortise and tenon joinery. It would be helpful if the system could make the mortises at least 1/4 inch deeper than the current maximum of 28 mm (nominal; actual is 29 mm) and use accordingly longer tenons. The machine can also be used as a handy small mortiser even without using dominos. It would be interesting to hear of readers’ experiences with Domino joints. 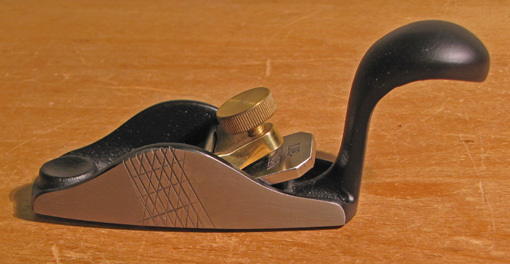 Lie-Nielsen Convex Sole Plane, September 11, 2010. Finger grips filed into the sides of the plane have proven helpful. In general, I almost feel that a tool isn’t really part of my repertoire until I’ve done something to personalize it. 8 Simple Shop Tips and Conveniences, February 15, 2010. The Ni-MH batteries in the Panasonic drill-light set have finally died after a long, productive life. 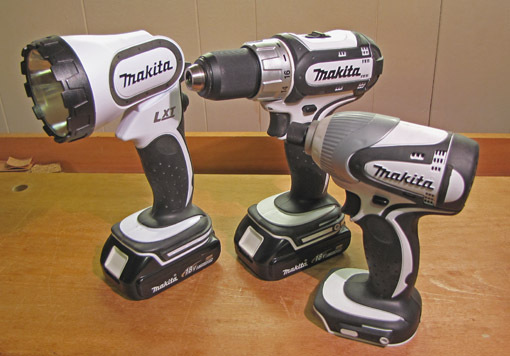 I replaced the set with the Makita LCT 300W 18-volt drill-impact driver-light set which uses Li-ion batteries. Wow – lots lighter, faster and longer-lasting charge, and what a buy. The impact driver is more for DIY than furniture making but it’s a serious bad boy with 1280 inch-pounds of torque. Minimax E-16 Bandsaw, May 18, 2009. It appears from the Minimax website that this model is no longer available from them. The E-16 remains a good fit for my shop because it covers just about all my needs while being lighter and more maneuverable than the more popular MM-16. Nevertheless, I feel as strongly as ever that a quality bandsaw will expand most woodworkers’ range of work as few other tools can and more than any other machine. Bandsaws do not take up much space and can be made mobile. I suggest a steel frame saw with at least 12 inches of resaw height. How Much Camber Should Be in Plane Irons?, May 21, 2009. Having received a few questions on this, nope, I still won’t say how much. IT DEPENDS. And don’t bother measuring it. In addition to the plane’s function (smoothing, jack, etc.) and the bevel up or down factors, other issues include: is the plane skewed in use (which makes the camber’s “sag” have a shorter span), how sharp is the blade, how hard is the wood, and how is the cap iron adjusted? Also, the amount of downward deflection of the blade’s edge will be altered by most of these factors which will, in turn, affect the functional effect of the camber. The key is to monitor the feedback from the blade’s performance and make adjustments at the next sharpening session. Usually, camber is overdone. Fortunately, this is easy to correct, since most of the dullness is at the crown of the camber where it is readily honed away. An Inexpensive Saw that Does Its Job Well, May 30, 2010. This has been a great workhorse in the shop. I wonder if it could be manufactured with a taper-ground plate for a little higher price. That, and a little better handle geometry would make it even better. There’s always more to learn! Wow! Filing grooves in your Lie-Nielsen seems a little radical. I think I would have tried gluing on some sandpaper first. The filing worked out well. Thanks. I’ve resawed over 10″ hardwoods and the MM has been smooth and accurate. It’s not speedy at that thickness but fast enough for my small shop with a good blade – a must. It’s certainly not as fast as the MM-16 with twice the HP (4.8) but also 200 more pounds and now nearly twice the price. Minimax and Agazzani are good options. 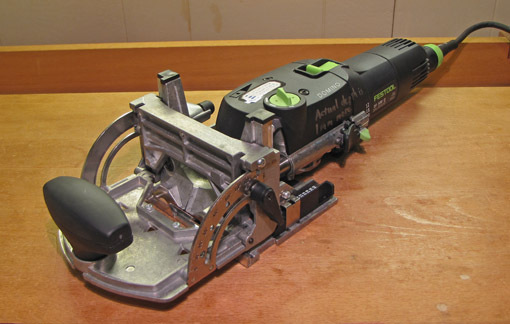 Grizzly saws also have been getting good reviews at a lower price point. Good luck. You’ve helped a lot over the year, so Happy New Year and many more. I love my Domino and use it as much as I can so long as it fits within what I want to do — all hand work vs. hybrid. I was faced with the same dilemma re: a saw handle. Had a good old blade from the Bay but the handle felt terrible. I’m in “the process” of making a new walnut handle for the saw (and shaping and sharpening the blade). I’m using an o-l-d Disston handle as a model. We’re wood workers, we can do anything! Thanks, Steve. I’m glad some of this blog is useful. And yea, woodworkers are a resourceful bunch.